Auricular Acupuncture is a complementary therapy where acupuncture points on the outer ear are gently stimulated using either a needle, a small pellet, or even very mild laser surgery. The ear is actually a microcosm which represents every organ, tissue, and system within the human being. This perspective provides us with a very powerful and exact method to analyze and treat just about any health problem. Best known as an effective tool to remove addictive cravings to tobacco and drugs, auricular acupuncture is also an extremely powerful method for pain relief and in the treatment of various musculo-skeletal problems. For example, if your shoulder is hurting because of an injury, the pain can be relieved by stimulation of the corresponding point in the ear. Or, if you have poor digestion or ulcers because your stomach is weak it can be treated through stimulating specific points on the ear. Auricular Acupuncture treats many conditions, including: Acute pain, chronic pain form injuries, arthritis, or pains that just showed up – pains you were told you would just have to live with. Infections like colds, flus, ear infections, swollen glands, chroinc visual infections – getting off the vicious cycle of anti-biotics. Gynecological disorders such as PMS, menstrual and ovarian dysfunction – an alternative to aspirins and operations. Poor digestion, heartburn, ulcers, constipation, gall bladder dysfunction, hemorrhoids – putting the digestive tract in order. Allergies, food sensitivities, candida, chronic chemical or energetic toxicity – coming to terms with your environment. Immune dysfunction – bolstering your defense systems. Nervous and stress related disorders including insomnia, headaches, irritability, panic attacks and phobias – calming down. General weakness, fatigue, poor memory and concentration – beginning to live up to your potential. In 1951, a French physician named Paul Nogier began the research that led to the full flowering of this system. Beginning with the treatment of acute pain and the development of and exact map of the ear, Nogier and a group of medical disciples went on to create an entire sophisticated system of the medicine. They discovered how to diagnose disease by noting the disruptions in the energy pattern of the ear. They learned to treat chronic problems as well as acute ones, physical ailments as well as emotional ones. They were also able to treat conditions where no medical diagnosis could be given. As long as the energy structure of the ear could be determined, it provided a wonderful window into the structure and malfunctions of the body. The evolution of this complex system has never stopped. As time goes on, it grows more sophisticated and effective. Another major step forward has been the use of Auricular Medicine to test the effect external substances have on any particular person. These substances could be types of foods, vitamins, medical drugs, herbal or homeopathic remedies, or toxic materials found in our air, food and water. It has even become possible to detect whether or not harmful radioactive, electromagnetic or geopathic energies are disrupting the health of a patient. This powerful technique tells us if there are allergies to particular foods or if there is an undiagnosed point poisoning of the system. It tells us whether a particular drug will be effective, what the dosage ought to be and whether it will have negative side-effects – all this before even having to actually take the drug. This aspect of Auricular Medicine is called substance or remedy testing. The precision of Auricular Medicine has become so great that often a disorder will be found that will not show up in any standard medical examination or laboratory test. The problem is still at such an early stage that there is no change in the cells or tissues of the body. This is perhaps the most wonderful aspect of the whole system. It enables us to know that the energies of the body are disrupted and that there is now a tendency for a certain conditions or disease to emerge before the outward symptoms show up. This is a true form of preventive medicine. 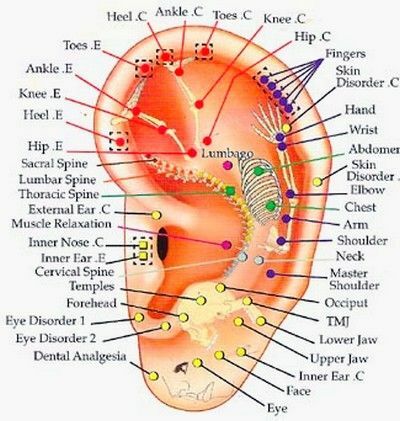 Auricular Medicine also allows us to see the true origins of many of the diseased conditions already showing up in the body. So many times treatment is aimed at stopping symptoms that are showing up right now. But this ignores the roots of the problem. The history and the development of the condition are unknown making a thorough cure impossible. With Auricular Medicine we can become a detective searching out the real story behind and illness. During a session with a practitioner of Auricular Medicine the patient lies face up with one hand placed over the stomach and the other raised up over the shoulder. The practitioner holds the wrist of the raised up hand, placing a thumb over the pulse of the radial artery. With the other hand, a filter is waved back and forth directed toward or away from the ear. In most cases the left hand of the practitioner is feeling the pulse at the patient’s left wrist, and the filter is held in the right hand moving in or away from the right ear. To understand the technique in more detail, several concepts must be explained. First, surrounding the body is an energy field which is analagous to the electromagnetic fields that surround a star of planet. This field expands or contracts in response to stimuli that either strengthen or weaken it. If an energy approaches the body which has an enhancing effect on the body, the field becomes tighter or more closely knit so that the field will shrink and approach the surface of the body. On the other hand, if a negative weakening force comes into the energy field it will lose its bonding strength and float outward from the body. If we could know where the border of the energy field is and how it responds to different stimuli, then it would be possible to know whether a particular stimulus – be it a type of substance or a needle in a certain point in the ear – is a positive or negative influence on the body. It is exactly for this reason that the practitioner feels the pulse and waves the filter. When the filter breaks through the edge of the energy field, there is a subtle full-bodied reaction that is mediated by the autonomic nervous system. The body is stressed by this invasion and “shudders” in response. Part of this response is that the arteries of the body constrict ever so slightly. As the filter passes through the outer border of the energy field, the practitioner can feel a small “twang” in the pulse. It is also essential to understand that the body reacts ever so subtly to substances or energies that interact with its own energy fields even before those substances or energies enter into the body. If we place an energy that strengthens the body in the energy field without having the patient actually swallow it, the energy field will become stronger and move in toward the body. Likewise, a negative force will move the fields outward before it actually enters the body. In a similar way, the field can be made to move back and forth by “stressing ” or stimulating points on the ear that correspond to dysfunctional body tissues. Often a patient assumes that the devices used in Auricular Medicine are machines. For the most part, this is not so. Two wires with stabilizing filters are placed on the neck and hand respectively. These wires lead into separate metal “honeycombs” and boxes filled with different substances. The energy of these substances or of anything placed into the honeycomb is transmitted to the body through the wires. It has been found that an energy transmitted to the body will be interpreted as entering in the body’s energy system. An energy transmitted to the neck will be interpreted as being eliminated from the energy system. Although this latter point is somewhat difficult to explain, it has been found clinically accurate and is related to the functioning of different parts of the nervous system. Without having any substance in either the honeycomb to the neck or hand, we find that the pulse “twangs” at a distance of 2 inches from the ear as we wave the filter toward the head. If we drop a vial containing sugar into the honeycomb leading to the hand and find that the pulse registers at a distance of 5 inches from the ear, then we know that sugar weakens the energy structure of the patient and is therefore a negative influence. This can be double checked by placing the same vial into the honeycomb leading to the neck. If the pulse registers at a distance of 1 inch from the ear, we know that the body is stronger when sugar is removed from the system and our original assumption has been confirmed. The same experiment can be done with vials of different tissues of the body. For example, if we think that he liver of the patient is weakened we can place a vial of specially prepared liver tissue into the hand honeycomb. If the energy structure moves outward we know that putting “liver energy” into the system has weakened it, that is, the body is stressed by liver energy. An even more accurate result could be found by placing the liver vial in the neck honeycomb. If the liver is really weakened or stressed, the removal of this “liver energy” will enhance the body’s strength and the field will therefore move inward. If we pass a light over the surface of the ear, points in the ear that represent stressed or weakened tissues will react as the light passes over them. This stress will also register as a “twang” of the pulse. If, for example, a light shinning on the liver point produces a strong twang then we can assume that the liver energy is disrupted. We could test our assumption by doing (2) above. We could then stimulate the liver point that has shown up as stressed. If after stimulating this point (by needle, pellet or laser), the energy field moves inward then we know that we have strengthened the body. It is possible to judge that a particular treatment using Auricular Medicine is finished when the energy field has moved in close to the ear. This might happen after anywhere from one to six or seven points are stimulated in the ear.